Where to find the best Venice Italy Hotels? ...The romance... The atmosphere in Venice... You will experience it in Venice Italy Hotels. There are more than 500 hotels in Venice waiting for you in the heart of the lagoon... Cheap hotels and luxury hotels. But how to choose the best hotel? -----> This is my guide about Venice hotels and the best places for sleeping in Venice. You want the best? This city has it all. Read where I slept and experience my personal tips! For example my stay at Hotel Lisbona. A great hotel when you are visiting Venice. Hotel Lisbona enjoys the privilege of a central location with a fare night rate. Read here about the hotels I have visited, my experience and tips. The last hotel that I stayed is Hotel Palazzo Priuli. With my family (2 kids) I had a really great time. Great room and location. Please tell me your experience on Hotel Palazzo Priuli. As I wrote, my first hotel was 3 nights in hotel Lisbona, including a simple continental breakfast. It was a kind of honymoon, romantic holiday... A nice Canal hotel in Venice style! 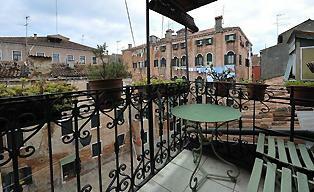 The price is cheap and very near Piazza San Marco, the heart of Venice. Don't care about the cheap and old Venetian decoration style. The price is cheap in comparing the location! Poor me... Well,, I can't afford every visit a 5 star hotel! But, maybe you can do once! Imagine... When opening your windows at a luxury Charming hotel in Venice. The Piazza San Marco is at your doorstep. If you have the possibility,, Go! It’s a life time experience. People contact me about which hotel I should advice. My answer is always that I prefer a Hotel in Venice centre. The city is right on your doorstep. Early in the morning Venice is at his best. You can only experience this when your hotel is in the centre. 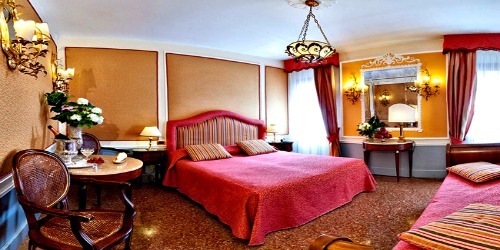 An example of good affordable hotel in the centre of Venice and near the Rialto bridge is Hotel al Vagon. Check this hotel which has no breakfast facility. You have to arrange this by yourself. But, it is a comfortable hotel on a nice location. I stayed here when I joined the marathon of Venice. Prepare good and book on time. Read my advice and reviews about the hotels. Your hotel needs to give comfort, so you can enjoy and relax. After a whole day walking and exploring Venice, you need a rest. And also romance of course ;). No annoying sound, stinky rooms and an uncomfortable bed. In Venice Italy there are a lot of hotels which have small rooms. Even in 3 star hotels they have old decoration and it is too cozy. You can book one of the many Venice luxury hotels. Probably you know these Venice hotels from celebrity news or movies. For example James Bond in Hotel Cipriani. You have read about the Venice Hotels in Italy. There is plenty to offer, as you see. Please click on the links to explore my site more and get even more information.